One thing you don’t need is the double stress of finding a diaper bag appropriate for double the amount of necessities. We’ve done the research to find the very best diaper bag for twins. We found not one, not two, but four excellent choices to get you through the infant years. Big Nation’s diaper backpack is a sturdy, full-mouthed bag with plenty of space for twice the stuff. It’s made of high-quality polyester, which resists stains and is moderately waterproof. The material will last a lot longer than other types of materials. 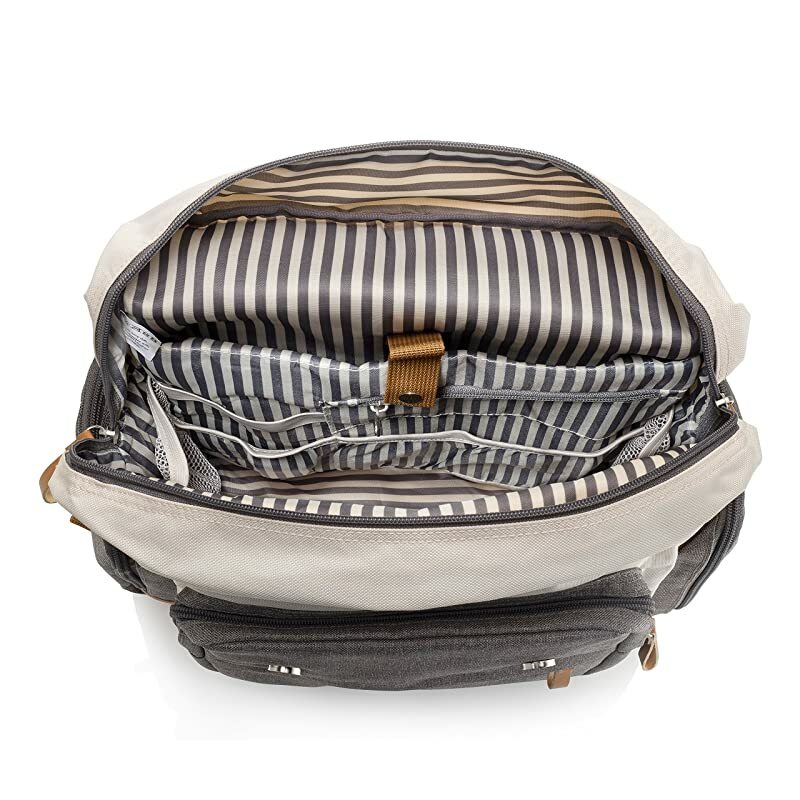 It comes with 14 pockets to help you organize all the things, plus an extra-large changing pad and a sundry bag for smaller items. An insulated exterior pocket holds two regular sized bottles and reduces the risk of spills bleeding over into other supplies. If more bottles are needed, there is plenty of space on the interior. There’s also a dedicated pocket for wipes that allows you to dispense wipes or tissues easily without removing the package. It has an extendable keychain and comes with stroller straps for times when you don’t want to carry the bag on your back. It’s a neutral, solid black. The sundry bag is big enough for soiled clothes, but can also be used as a purse for mom, or to organize smaller items that can get lost easily. Ergonomically curved straps and a padded, breathable mesh back make the bag as comfortable as possible to carry. Its material is non-toxic and BPA free. There’s a single handle on top so that you can hang the bag up on a hook to keep it off the floor and out of the way. It can get a little bulky when packed full, with some of the pockets protruding and limiting your range of motion. Otherwise, most items can be packed in pickets leaving the interior free to carry unexpected items gathered throughout the day. 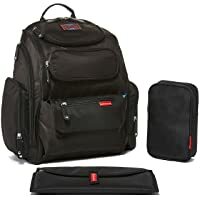 Big Nation stands behind their diaper bags, and the company offers a limited warranty for basic wear and tear on any of their products. Simply contact customer service for replacements and refunds. You can also check this video review below! 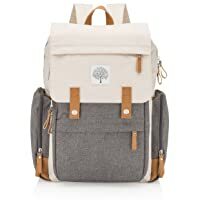 This Diaper bag is another large, backpack style diaper bag with plenty of storage and a neutral, unisex design. The main interior pocket has a wide mouth design that opens up to completely revel the interior contents and prevent having to unpack or dig to find needed items. The material is a waterproof, stain resistant fabric that is durable and easy to clean. The reinforced stitching prevents everyday wear and tear. The design features good quality, smooth zippers that won’t catch or tear. The front pocket is insulated and can hold up to three full-sized bottles. It can keep contents either warm or cold for hours, and the waterproof lining prevents any spills from contaminating the interior items. The side pockets feature two different designs for convenience. One side pocket holds wipes or tissues and dispenses them without having to remove the package. The other has a general pocket for carrying other types of essentials like an umbrella or wallet. The padded straps are adjustable for your comfort. It doesn’t come with a changing pad, but it does have an inner dirty clothes bag. There are stroller straps for time when you don’t want to carry the bag on your back. It isn’t machine washable, but the fabric is durable and easy to clean by hand. It merely wipes down with a dry or wet cloth. 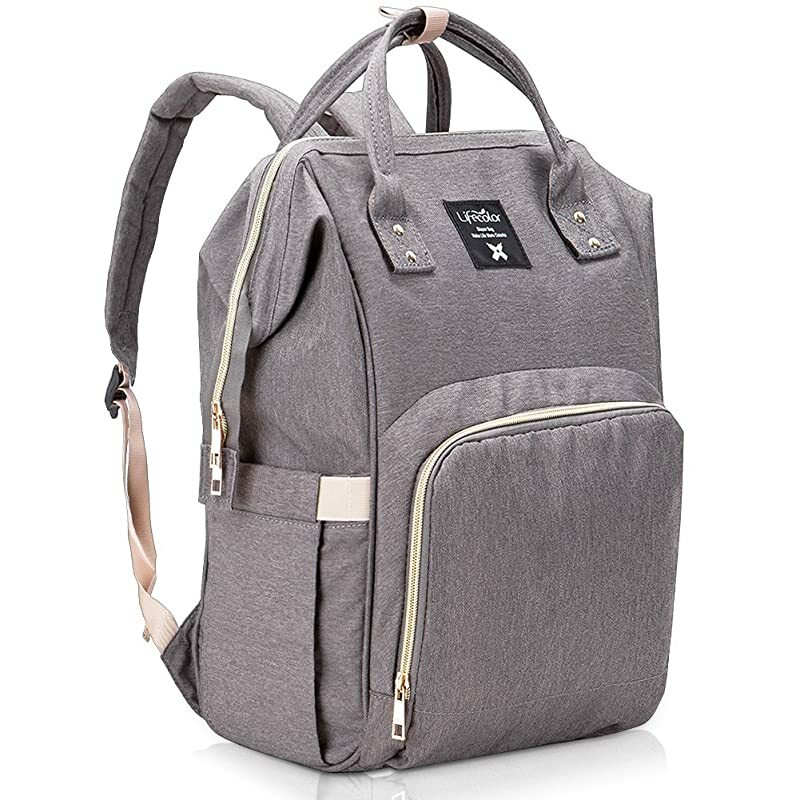 There’s a hanging strap for better storage, and the color is a neutral, unisex gray canvas material (Now, other colors are available). There’s also a key clip to prevent losing the most essential item of all, the keys. The bag is lightweight, but the bottle elastics might take some maneuvering. The company offers a 30-day money back guarantee should anything go wrong with the bag or if it isn’t the perfect look for you once you get it in your hands. Anne is sharing his opinion about this Diaper bag you can watch the video bellow for more details. 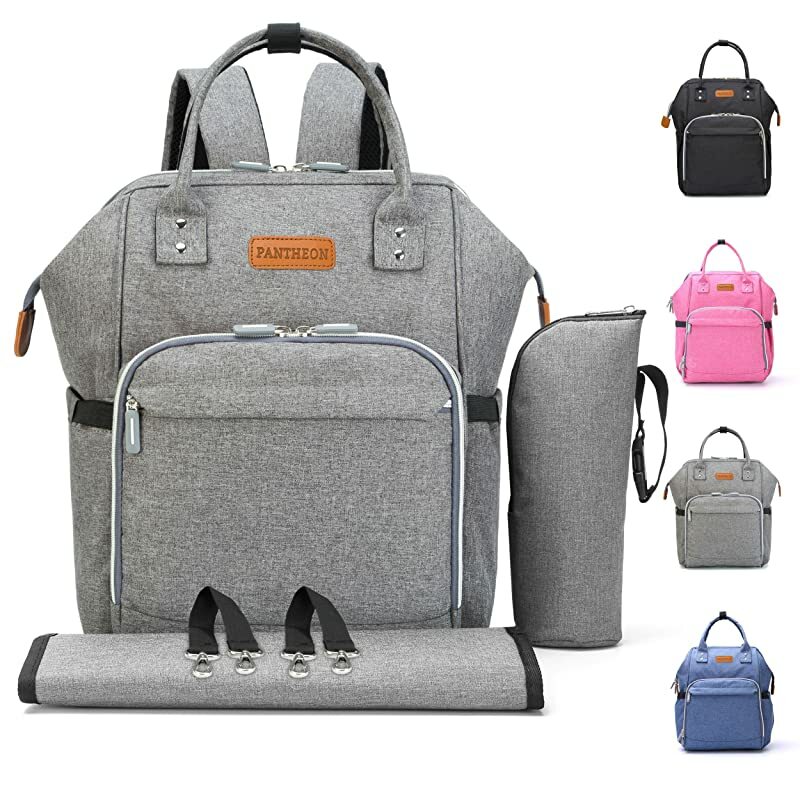 Pantheon’s Diaper Backpack is a wide-open design meaning that the entire main pocket is accessible through an expanding, extra wide, zip opening. Because of this expansion, it’s excellent for storing twice the necessities. The material is a high-quality stain resistant material that repels water and dirt. The front pocket is an insulated cooler that stores up to three full-sized bottles for easy transport and is waterproof to prevent spills from making their way to the interior pocket. It includes a changing pad. The bottom of the bag is a waterproof material that is designed to protect clothes, diapers and other goodies. There are a total of 14 pockets. The main interior pocket is divided into four other pockets to help with organizing. The back is a pocket specially designed to dispense wipes or tissues. Other pockets located on the back, front, and sides further help organize all the stuff associated with twins. The bag can be worn on the back like a traditional backpack, but it also includes stroller strap attachments to carry on the stroller. 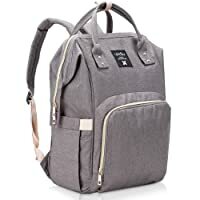 It has an overall polished look that is a unisex, classic gray canvas. It even includes a back strap to secure it to a suitcase handle in the event of traveling especially through an airport. One downside to this bag is the outer pockets don’t all have elastic. This design could lead to wear and tear around the pocket edges. Also, the interior pocket zipper is difficult to unzip with one hand. The best features overall are the way each pocket is individually waterproofed to prevent from accidental spills ruining everything in the bag. It ensures that you don’t worry that loading the bag full will result in disaster. Pantheon includes an excellent warranty. If anything happens to your bag within the first 18 months, Pantheon will do its best to make it right. Just contact the company for a replacement part, full replacement, or a refund. Finally, the Parker Baby backpack, a classy take on the traditional diaper bag. It features a neutral, two-color design that’s made of durable, waterproof material. The outer material is canvas, and the accents are vegan leather. The interior is waterproof polyester. There are more than ten pockets including two insulated, side pockets for holding bottles or other food items. 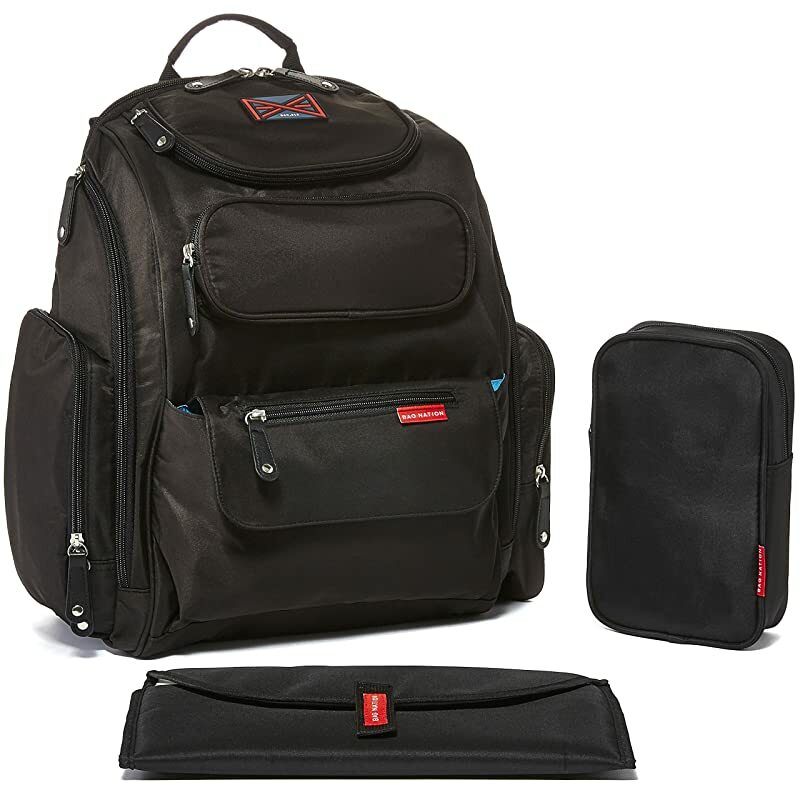 There’s also a padded laptop pocket, a front mom pocket for smaller odds and ends, and a mesh diaper organizer. It comes with a changing pad and stroller straps to hang the bag during times when you are tired of carrying it. It doesn’t have a dedicated wipes pouch, but it does feature plenty of interior room to store things like that. 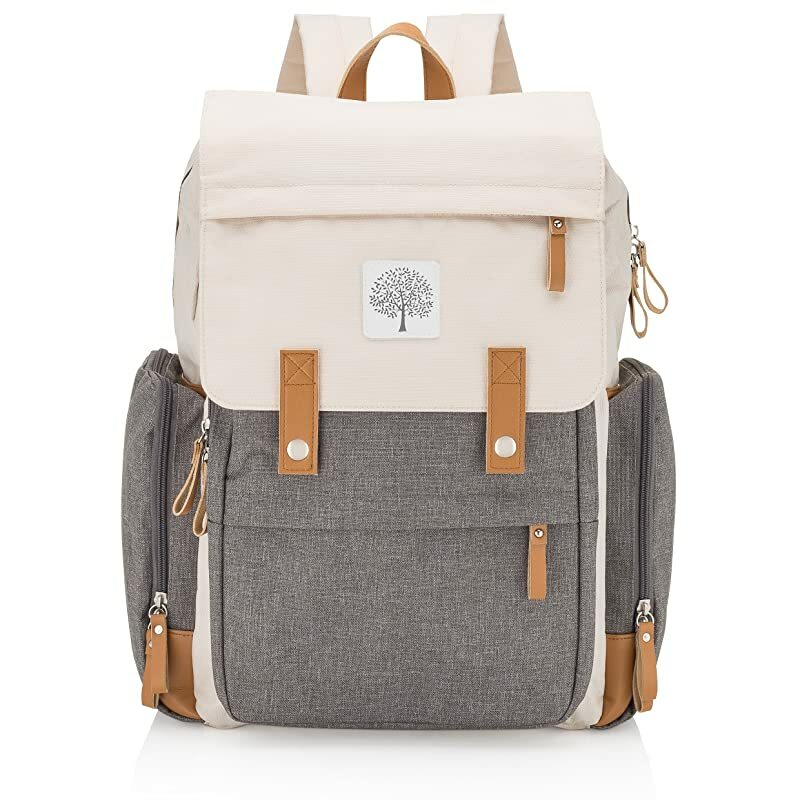 The light colored canvas does show dirt more easily, and the bag isn’t machine washable. Keeping it wiped down by hand will preserve the look of the canvas, but this might be inconvenient, especially for a parent of twins. The company has a warranty, and should anything happen to the bag within the first 30 days, just contact the company for a refund or replacement. Overall, this is the trendiest bag of the list and will fit parents who are trendsetters well. There are a few things to consider when choosing the best diaper bag for twins. The most important one is picking a bag that will organize double the stuff without being too heavy. Most likely, traditional diaper bags will be heavier and put strain on the shoulder as you carry it. Backpack designs distribute the extra weight more evenly across the back, helping support your frame and prevent strain. Another feature is independently waterproof pockets. Carrying a lot of stuff means spills and accidents, and you don’t want your bottles ruining your diapers. Another consideration is extra insulation for the bottle and food storage pockets so that you don’t have to worry about bottles ruining while you’re out and about. A third consideration is the type of material. Waterproof and stain-resistant materials help your diaper bag look new despite everyday wear and tear. Most diaper bags are hand washable, and a few are even machine washable. Smaller features are essential as you like. If you regularly lose your keys, you might want a dedicated ring for them to hang in sight. If you don’t like unpacking a bag to get to the wipes, then a specialized wipes pouch will be essential. Overall, the design of your twins diaper bag should be one that is organized and can fit double the items of a regular diaper bag. 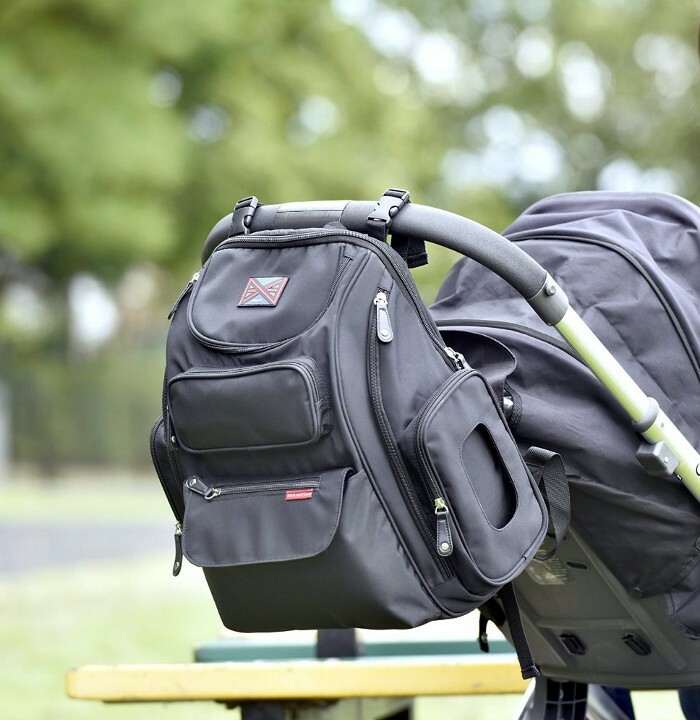 Choosing the best diaper bag for twins might seem difficult, but there are options out there that won’t have you rubbing your temples in frustration. Which bag did you choose? Let us know in the comments below and tell us how things are going with your twins! Photo & Video credits: Swirlz Twirlz, AnneYhungTV, Amazon.